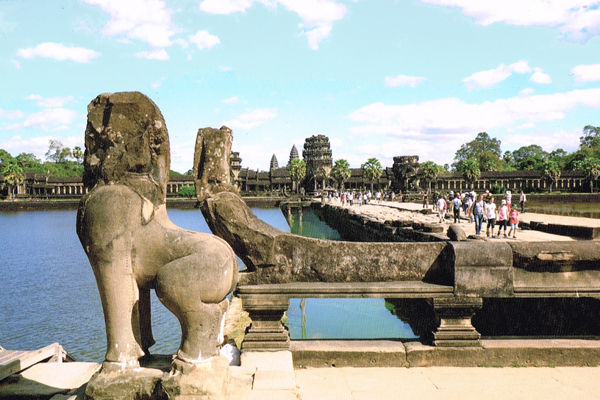 Angkor Wat is a UNESCO World Heritage Site [WHS], as part of Angkor Archaeological Park, which was listed in 1992. Angkor Archaeological Park contains the magnificent remains of the different capitals of the Khmer Empire, from the 9th to the 15th century. 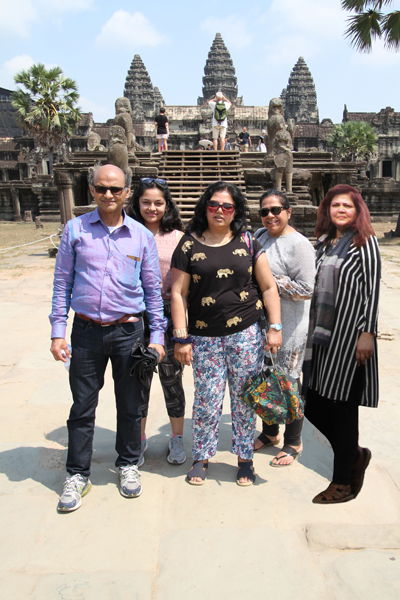 They include the famous Temple of Angkor Wat , and also monuments like Bayon, Baphoun, Elephant Terrace, Ta Prohm, Preah Khan, and Banteay Srei. 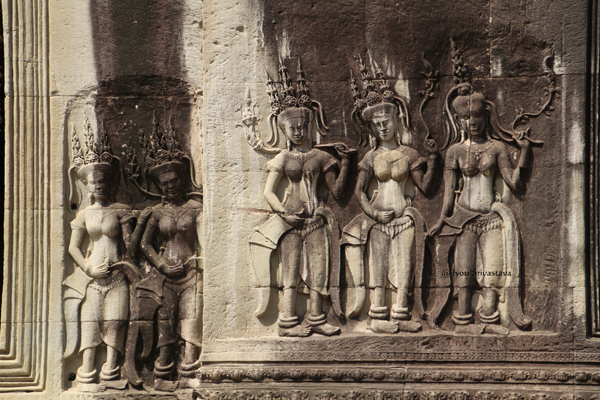 UNESCO inscribed the Angkor Archaeological Park on the World Heritage List in 1992. The Angkor Archaeological Park contains the magnificent remains of the different capitals of the Khmer Empire, from the 9th to the 15th century. 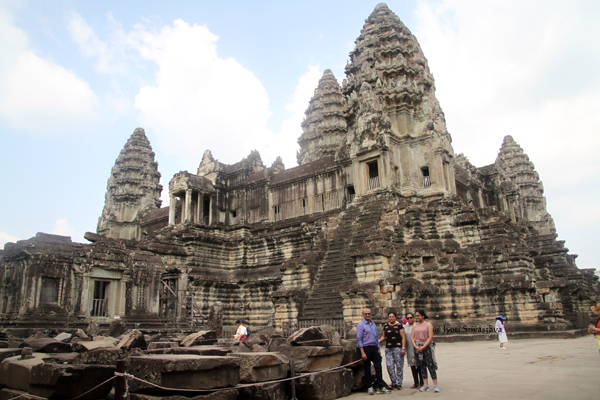 Angkor Archaeological Park does not mean only Angkor Wat, but including many ruins in the vicinity areas such as Bayon, Ta Prohm, Preah Khan, Banteay Srei and the Rolous complex. All these are part of the World Heritage Site. 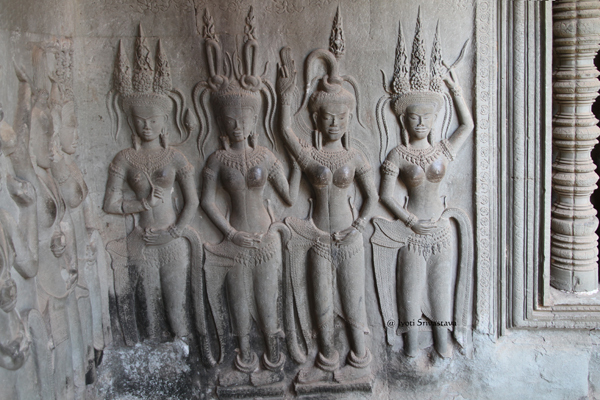 Also Cambodia’s “Intagible Cultures” – Apsara Dance, and the Khmer Shadow Theater – have also been declared as World Heritage by UNESCO. 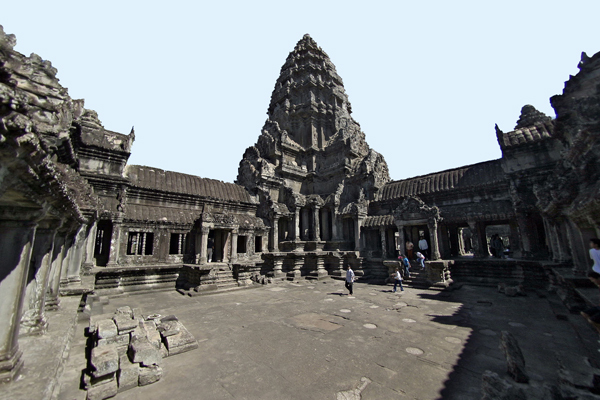 Angkor Wat is a major site in the Angkor Archaeological Park. It exemplifies cultural, religious and symbolic values, as well as contain high architectural, archaeological and artistic significance. 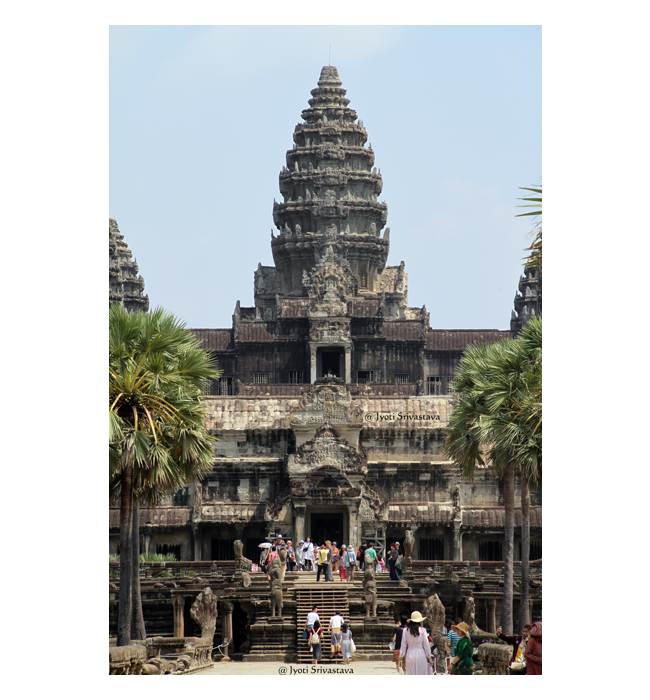 NATIONAL FLAG: The Angkor Wat temple complex is at the top of the high classical style of Khmer architecture. It has become a symbol of Cambodia appearing on its national flag, and it is the country’s prime attraction for visitors. Angkor Wat / Siem Reap, Cambodia. 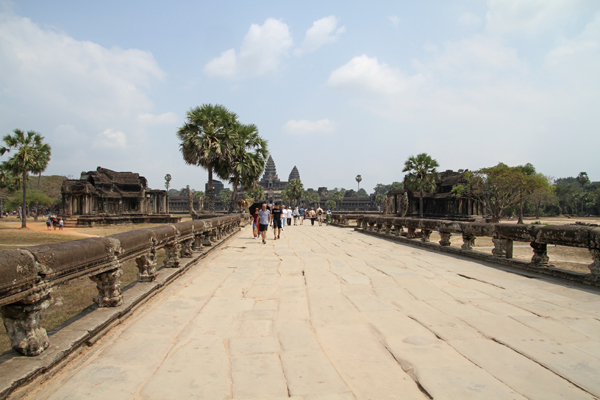 ANGKOR WAT – UNESCO World Heritage Site, as part of Angkor Archaeological Park. 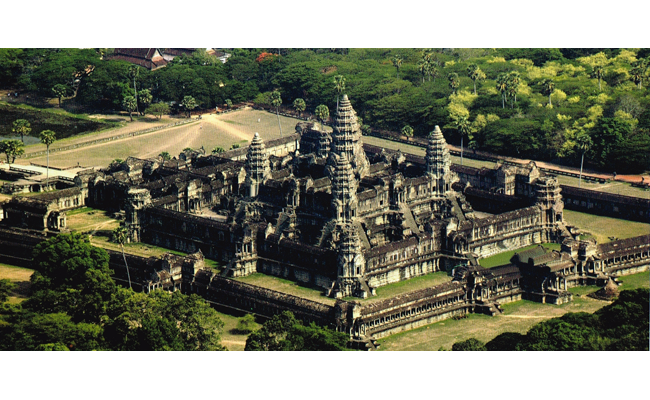 Angkor Wat is a temple complex in Cambodia and the largest religious monument in the world, measuring 402 acres. 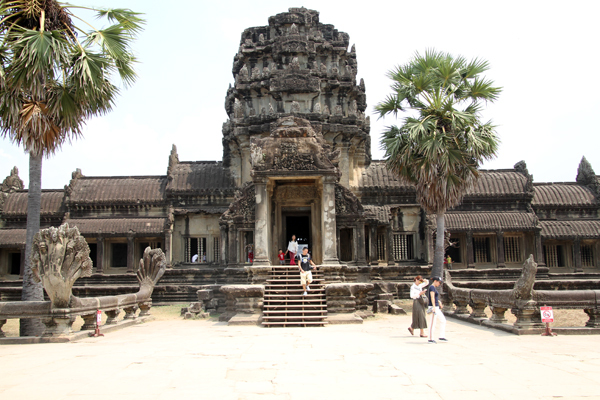 It was built by the Khmer King Suryavarman II in the early 12th century in Yaśodharapura (present-day Angkor), the capital of the Khmer Empire, as his state temple. In 1177, approximately 27 years after the death of Suryavarman II, Angkor was sacked by the Chams, the traditional enemies of the Khmer. Thereafter the empire was restored by a new king, Jayavarman VII, who established a new capital and state temple (Angkor Thom and the Bayon respectively) a few kilometres to the north. 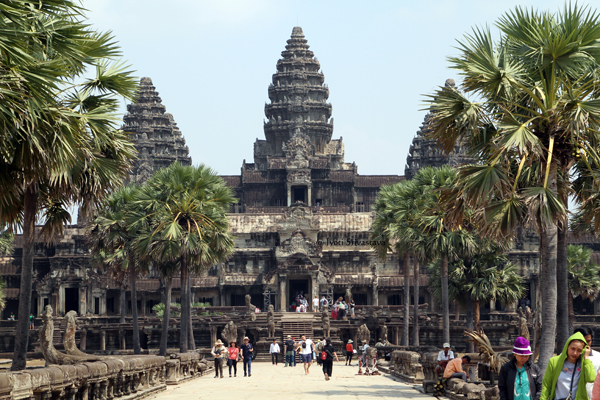 Angkor Wat was originally constructed as a Hindu temple of god Vishnu for the Khmer Empire. 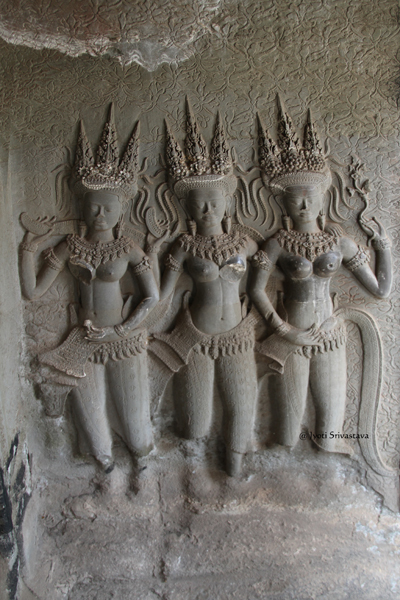 This was breaking from the Shaiva tradition of previous kings, Angkor Wat was instead dedicated to Vishnu. 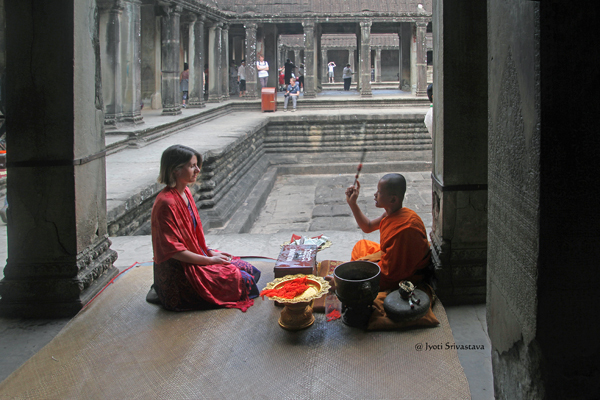 Towards the end of the 12th century, Angkor Wat gradually transformed from a Hindu centre of worship to Buddhism, which continues to the present day. Angkor Wat is a unique combination of the temple mountain (the standard design for the empire’s state temples) and the later plan of concentric galleries. The temple is a representation of Mount Meru, the home of the gods in Hindy mythology. The central quincunx of towers symbolizes the five peaks of the mountain, and the walls and moat symbolize the surrounding mountain ranges and ocean. Note: Quincunx – an arrangement of five things in a square or rectangle with one at each corner and one in the middle. 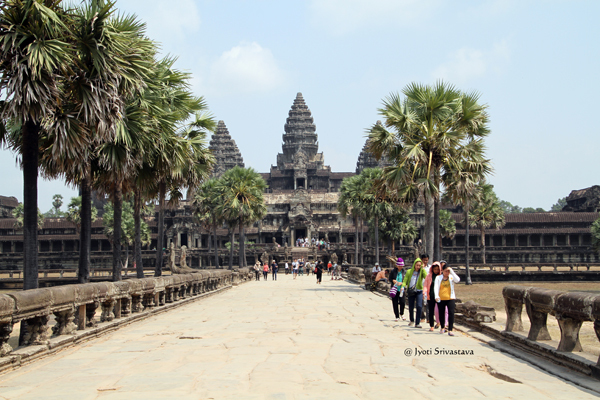 Unlike most Khmer temples, Angkor Wat is oriented to the west rather than the east. 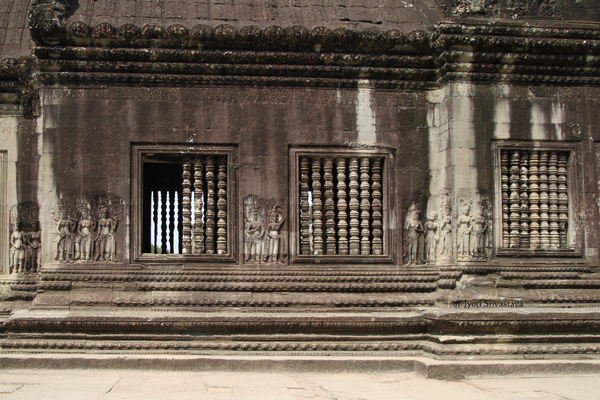 This has led many to conclude that Suryavarman intended it to serve as his funerary temple. 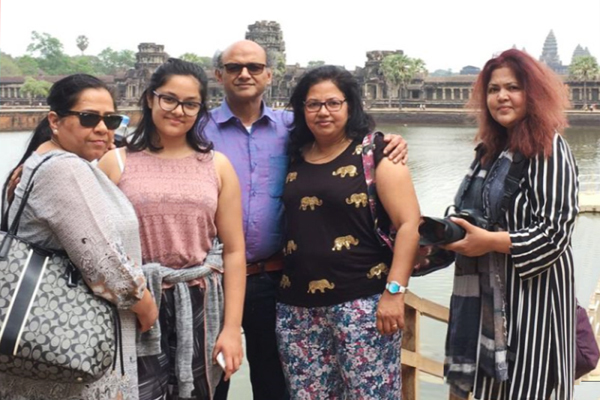 Others note that several other temples of Angkor depart from the typical eastern orientation, and suggest that Angkor Wat’s alignment was due to its dedication to Vishnu, who was associated with the west. 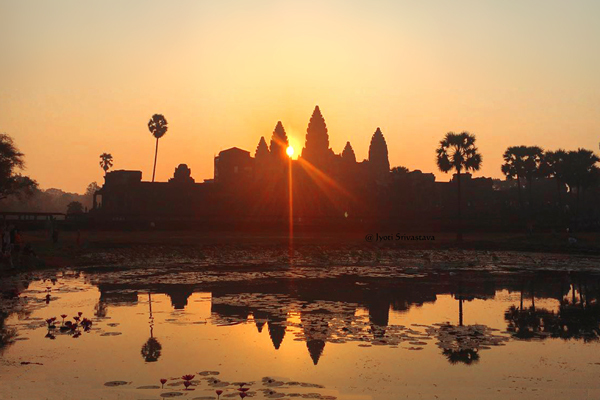 Angkor Wat / Siem Reap, Cambodia./ Image: Picture postcard. 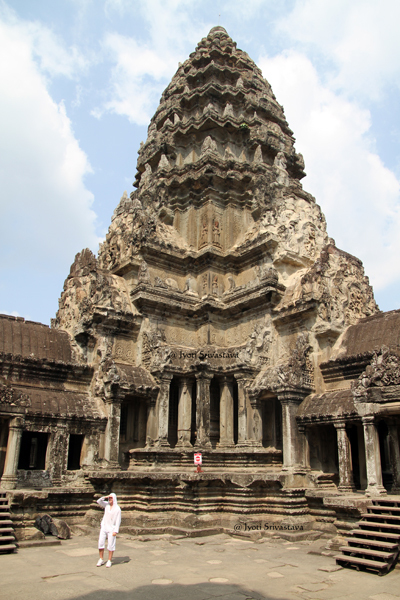 The height of Angkor Wat from the ground to the top of the central tower is about 700 feet. It is achieved with three rectangular or square levels. Each one is progressively smaller and higher than the one below starting from the outer limits of the temple. The main entrance to the temple is from the west, from the causeway that will bring us to three concentric galleries before reaching the peak. 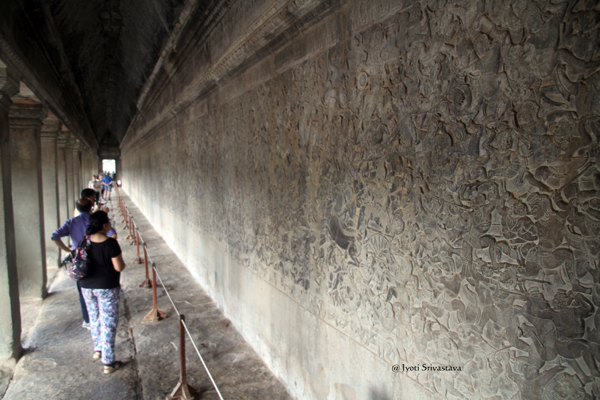 First Level Galleries – The temple complex is surrounded by a moat [650 feet-wide moat, about 13 feet deep]. The moat that encompasses a perimeter of more than 3 miles. A long sandstone causeway [length 820 feet; width 39 feet] leads to the First Level Galleries. It serves as the main access to the monument. Giant stone lions on each side of the terrace guard the monument. A figure of a standing Vishnu [eight arms] is in the right inside the entry tower. Traces of original color can be seen on the ceiling of the entry tower at the left. Second Level Galleries – Continue westward on the first level galleries, leads us to a second raised walkway [length 1,148 feet; width 30 feet]. A low balustrade resembling the body of a serpent borders each side. Short columns support the balustrade. Two buildings, so-called libraries stand in the courtyard on the left and right, just past the middle of the causeway. These ‘jewel-boxes Khmer art ‘are perfectly formed. 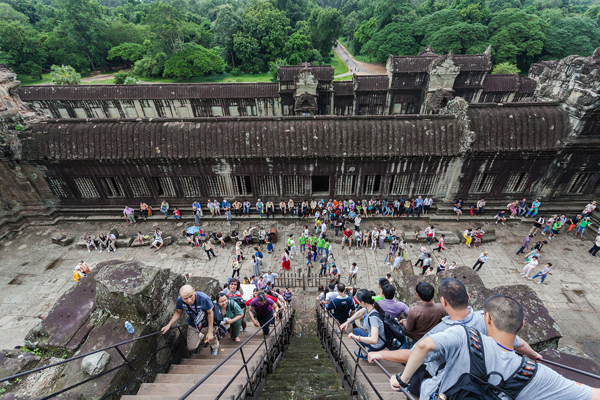 Third Level Galleries – The third level supports five towers – four in the corners and one in the middle and these is the most prominent architectural feature of Angkor Wat. This arrangement is sometimes called a quincunx. Graduated tiers, one rising above the other, give the towers a conical shape and, near the top, rows of lotuses taper to a point. (1) The outer wall corresponds to the mountains at the edge of the world, and the surrounding moat the oceans beyond. (2) The central tower rises from the center of the monument symbolizing the mythical mountain, Meru, situated at the center of the universe. Its five towers correspond to the peaks of Meru. 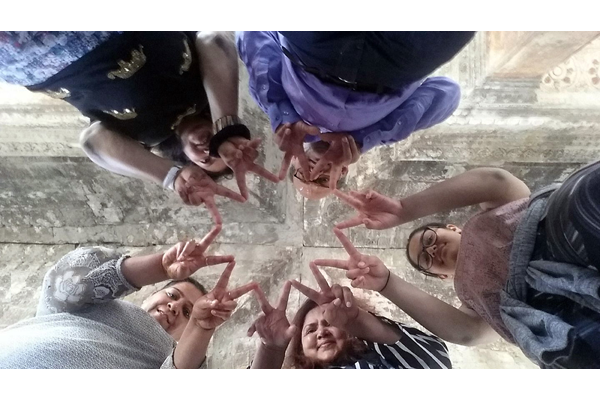 Our trip to Angkor Wat: Feb 19, 2018. 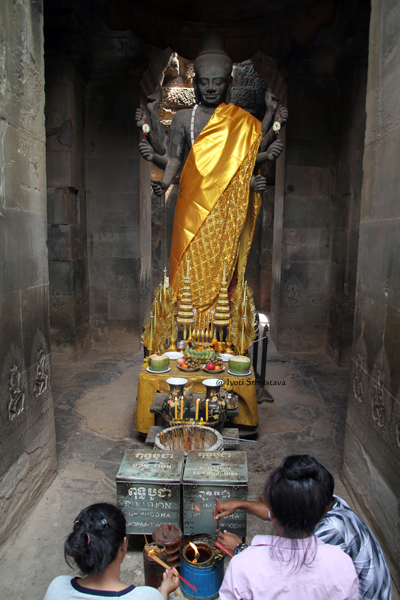 Statue of God Vishnu, known as Ta Reach under the southern tower of First Level Galleries / Angkor Wat / Siem Reap, Cambodia. 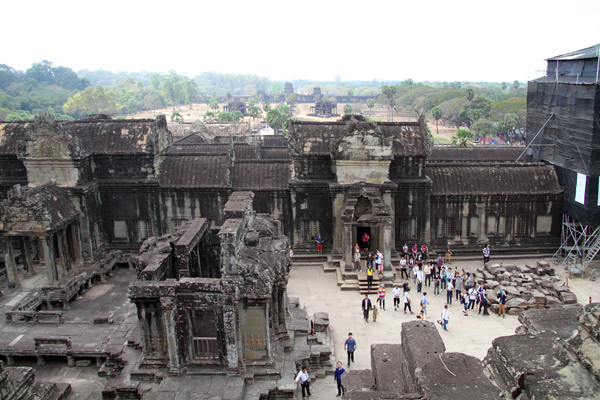 A wonderful view of the temple complex from the second walkway – Angkor Wat / Siem Reap, Cambodia. 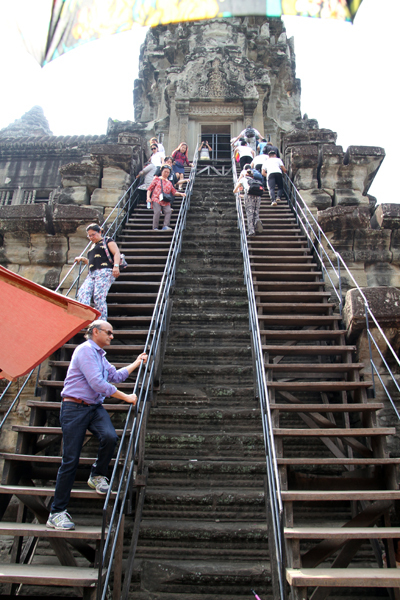 Steep Steps lead to Third Level Galleries./ Angkor Wat / Siem Reap, Cambodia. Third Level Galleries: Known as Bakan. 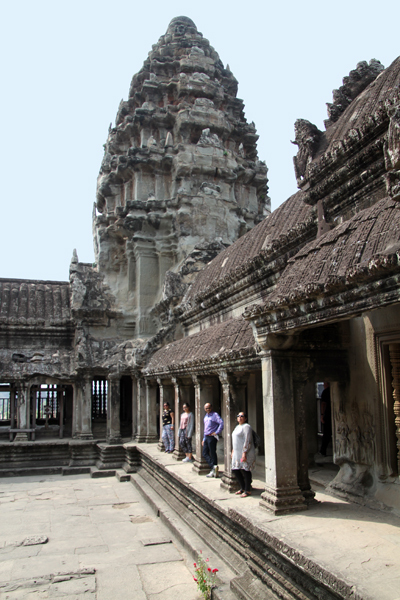 Bakan is the name of what used to be the principal sanctuary of Angkor Wat. 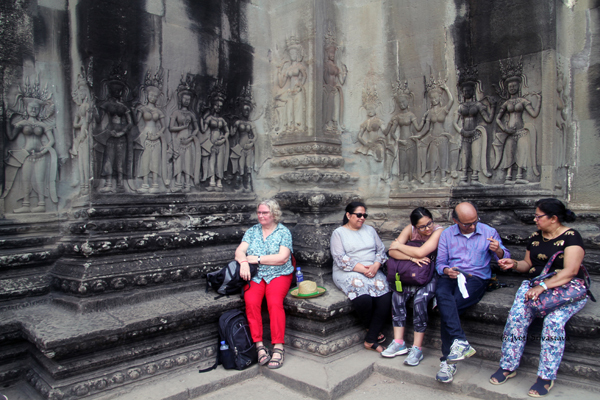 It is the summit of Angkor Wat’s central temple, the highest of temple’s three galleries and the uppermost point of world’s largest religious complex. The stairs to the upper level are immensely steep, because reaching the kingdom of the gods was no easy task. 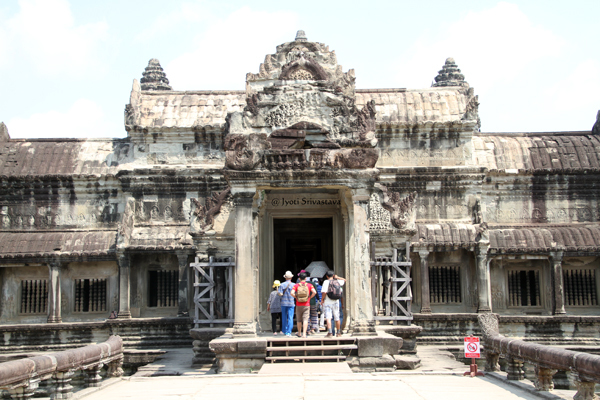 The upper level of Angkor Wat is open to a limited number per day with a queuing system. Steep steps lead to Bakan – the principal sanctuary of Angkor Wat – Third Level Galleries./ Angkor Wat / Siem Reap, Cambodia/ Image courtesy Wikipedia.